On behalf of the Directorate of Ethics and support to employees of the Border Services Agency of Canada, I would like to thank Dr. Francine Therrien for the high caliber lecture she presented at our annual meeting on February 9, 2011. Comments reflected the quality of the conference entitled “Strategies for optimizing mental health and brain performance”, which was unanimously considered a huge success. We have rarely seen such enthusiasm, interest and appreciation from an audience. Doctor Therrien, in her capacity as a dynamic and first notch speaker, presented innovative strategies based on proven evidence, at the confluence of the various health sciences. She captivated her audience by providing levers for change that can make a difference in every day life. In a nutshell, the conference proved to be a real spark for our team. I had on two occasions the opportunity to hear the lecture by Dr. Francine Therrien: once as part of our association meeting, the Canadian Association of Chemical Distributors (CACD), and another time in a public lecture, and each time I was impressed by her knowledge, her energy, her professionalism and her ability to communicate her knowledge. Her talk is lively, interactive, and it makes us think seriously about our way of life! Ms. Therrien brings a whole new vision of our mental and physical faculties, and treats us with the latest discoveries, while also suggesting ways to incorporate changes and improvements into our daily lives. I sincerely believe that this is a gift that one gives to oneself by attending this lecture, and I recommend it to anyone who wants to understand and improve not only their brain capacity, but also their physical health, and lead a better life! You’ll love it! President of the Canadian Association of Chemical Distributors, Quebec Region. “The Longueuil Service Centre personnel were fortunate to attend the lecture Well in your head, at best on the job. 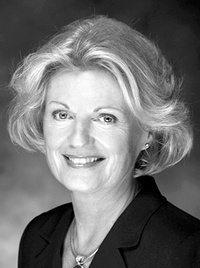 Jocelyne Monty is a former Chair of the Board of Directors of the Mental Illness Foundation and president of the Foundation Libermont. Her work for the cause of mental illness has won her several awards. She was made a Member of the Academy of Great Montrealers and is the recipient of the Jacques Voyer Humanism Award of the Association of Psychiatrists of Quebec (AMPQ). She was also the recipient of the National Champion of Mental Health award (the Alliance mental Illness and Mental Health) and of the philanthropic Merit Mercuriades 2008 of the Quebec Federation of chambers of Commerce, to name a few. Our brain can sometimes play tricks on us … but it can also make us gifts. The approach used by Neuroperforma brings hope because it reveals that the brain can enhance its capabilities and heal itself, and that, through methods accessible to all. All of us can benefit from the proposed methods because they can be used to treat or prevent certain mental health problems, but also to maximize the capabilities of the brain and therefore our most valuable human capabilities. I have a great concern for the cause of mental illness. It has indiscriminately afflicted babies, children, teenagers, women and men of all languages, all races, all social circles for hundreds or even thousands of years. Despite the knowledge of these facts, despite the breakthrough of information on the topic, today is still today plenty of shame and stigma attached to mental illness. These are present in people who suffer, as well as in the eyes of healthy people. It is even said that the stigma is stronger for sick persons, because it can lead to a low opinion of themselves. But this attitude is largely influenced by the looks and negative comments towards them. In front of their impotence, they have learned to be silent, to close in on themselves and isolate themselves, so that their life seems still more painful. Many sick people identify themselves with their disease, while in fact they are momentarily suffering individuals, who, on the other hand, are unique with their talents and knowledge, worthy of love and respect. The first time I met Francine Therrien, I was impressed by her passion for the cause of mental illness and sincere empathy for those who suffer. I would say that this passion and empathy led her to develop new approaches for both the treatment of mental illness and the optimization of our brain capacity. Francine presents an “active medicine”, an approach where the customer takes himself in hand with the help of the “coaching” of Francine and of her team. The customer takes concrete steps for his remission or mental discounting, with solutions that deliver results and hopes by promoting love and self-respect. They say it takes a village to raise a child. I think that to change our understanding of mental illness and our approach towards people suffering from mental health disorders, it takes the whole world and all of us, starting with people like Francine Therrien. Let us start by treating our patients with as much respect as their illnesses deserve, with empathy for their great suffering, admiration for their efforts to heal themselves. Not to mention love, for that is the treatment of choice for all of us, sick or not! For those of us who feel fragile, let us try applying the methods presented in the book “Rebuild Your Brain” in order not to have to live all the torments arising from a brain too much deteriorated by the stress of life. And for those who enjoy a good psychological health, the application of the methods proposed in this book can only enhance your abilities to make your life and the world better. If everyone took advantage of this humane and effective approach to develop one’s mental potential, when suffering or not from a mental health disorder, we could bring our significant contribution to improving the world we live in, a better brain at a the time.